In the first stages of any therapeutic development project, it is necessary to use a well-documented model system to compare novel therapeutics under scrutiny. Having a model system will provide the foundation for an effective screening assay and thereby enable investigators to effectively compare and contrast various biological behaviours of their therapeutics of interest. Importantly, the receptor for hyaluronan mediated motility, otherwise known as RHAMM, is commonly overexpressed in breast, colorectal, and prostate cancers. It has been shown to serve as a contributor for two of the six hallmarks of cancer, namely angiogenesis and invasion/metastasis. It is also important to note that RHAMM has been identified as a biomarker in some highly aggressive cancers. In this respect, it is reasonable to suggest that developing therapeutics that target RHAMM with high specificity may inhibit angiogenesis and invasion/metastasis from occurring and consequently limiting the spread of some aggressive cancers. Unfortunately, employment of recombinant protein technology has been largely ineffectual for adequate production and isolation of the full-length RHAMM protein, which is critical for in vitro binding studies. In this new publication, Dr. Leonard Luyt et al. use OpenSPR’s localized surface plasmon resonance technology to provide them with the key binding data needed for their latest discovery on cancer therapeutic development. The publication titled, “A truncated RHAMM protein for discovering novel therapeutic peptides” uses binding data generated from the OpenSPR to observe the binding behaviour of their chemically synthesized 7 kDa RHAMM “mini-protein” engineered for screening of candidate therapeutic peptides. RHAMM is a large, 95 kDa carbohydrate-binding protein responsible for a number of cellular processes including cell motility, tissue repair, and provoking innate immune responses. When overexpressed however, RHAMM has been indicated in two major oncogenic processes including stimulation of blood vessel growth (angiogenesis) and cellular invasion and spreading (invasion/metastasis). Historically, full-length RHAMM has been exceptionally difficult to produce and isolate for meaningful in vitro studies. As it maintains important roles in oncogenesis, it becomes very clear that RHAMM is crucial to investigate. Moreover, Hyaluronan (HA) is a high molecular weight polysaccharide and is found in high concentrations in the extracellular matrix. Upon fragmentation, HA tends to accumulate and prior investigations have demonstrated that these fragmentation-accumulation patterns are complicit in angiogenic processes. RHAMM tends to bind HA and subsequently interacts with CD44 (and some growth factor receptors). In turn, this activates a number of known cancerous pathways including RAS, ERK and MEK pathways. These pathways are largely responsible for uncontrolled cell growth, angiogenesis, and cellular trafficking, among others. Notably, the aforementioned pathway-dependent events are three of six hallmarks of cancer. It is important to note that the difficulty to produce and isolate full-length RHAMM proteins, compounded with the influence of HA-RHAMM binding in the subsequent oncogenic pathways, demonstrates there is a need to develop an alternative system to screen for potential RHAMM therapeutic disruptors. In this publication, the investigators synthesized a 7 kDA RHAMM “mini-protein” via Fmoc solid phase peptide synthesis and subsequently analyzed the structure of the truncated RHAMM using circular dichroism spectroscopy. It should be noted that the truncated RHAMM mini-protein was engineered to only comprise the HA binding localities but a negative control was also engineered without the crucial residues required for HA binding. Upon synthesis and structural analyses, surface plasmon resonance was then employed to measure the binding kinetics and affinity constants between the 7 kDa RHAMM mini-protein and it’s native ligand, HA. Moreover, a number of tubulin-derived HA peptide analogues known to bind recombinant RHAMM were also used to validate the binding ability of the synthesized RHAMM mini-protein. Importantly, the results of the SPR study proved that the 7 kDA RHAMM mini-protein is an excellent alternative to producing and isolating the full-length, recombinant RHAMM and thereby, allowing future studies on this important oncogenic factor to be much less demanding. Surface plasmon resonance (SPR) was used to understand the interactions between the truncated RHAMM protein, HA, and tubulin derived HA peptide analogues. It is important to note that a number of experiments were conducted on the OpenSPR and a number of different sensor chip surface chemistries were used. Firstly, plain gold chips were incubated with cystamine-functionalized HA for 3 days, and blocked to prevent non-specific binding. The functional RHAMM mini-protein and the corresponding negative control (Ala-RHAMM), were employed as analytes. Subsequently, RHAMM mini-protein with C-terminus His-tags on the were immobilized onto an NTA sensor chip and all tubulin derived HA peptide analogues were employed as analytes. Importantly, this binding data clearly indicates that the chemically synthesized RHAMM mini-protein can act as an effective proxy for screening of anti-cancer peptide candidates meant for disruption of the RHAMM-HA-CD44 binding event. In this respect, OpenSPR binding data provided quantitative evidence that suggests the cumbersome task of producing and isolating the full-length recombinant RHAMM protein may not be required. 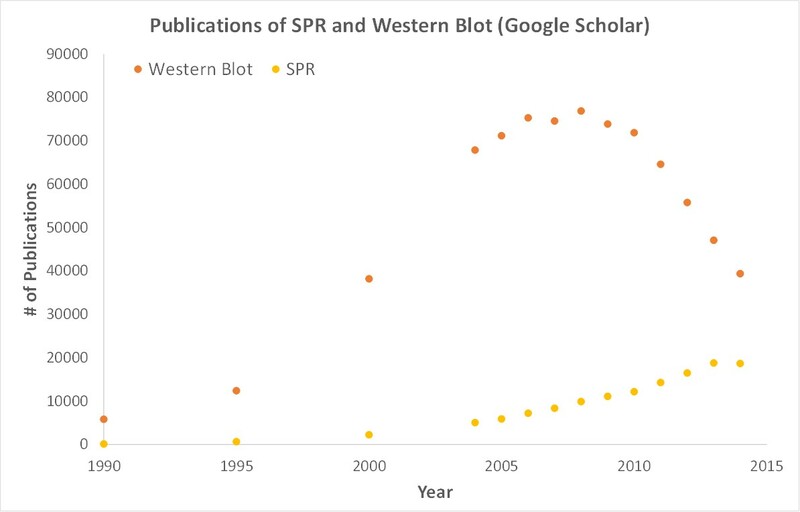 Additionally, by using OpenSPR, the researchers were able to get SPR data from their own bench to help them accelerate their research and publish their discovery faster. OpenSPR is a user-friendly and low maintenance benchtop SPR solution that is currently being used by hundreds of researchers. With access to SPR technology on your own lab bench you can get the high-quality data you need to accelerate your research and publish faster.